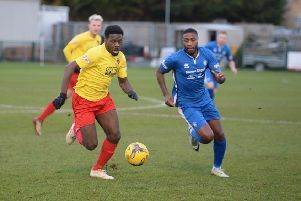 Dunstable Town’s fight to stay in the Southern League Premier Division was finally ended on Saturday as they were beaten 3-0 at Frome Town. Needing a win from their final match and hoping Gosport Borough, who had won 2-0 at Creasey Park on Thursday, slipped up, Blues fell behind on 14 minutes to Joe Raynes’ strike. Frome had a second on the half hour through Raynes, with Ryan Bath scoring in the 85th minute, consigning Dunstable to the drop. McCool said: “It was a long, tough draining year and so early after its conclusion of course we are all still hurting. “A league table doesn’t lie and we always knew it was going to be a mammoth task keeping this team in the league with zero playing budget when you consider the opposition we faced. “It took until near the end of the season for our players to learn how to manage games better and improve tactically but their ability was never in doubt and they are all so much better for the experience. McCool felt that the end of season run-in made it virtually impossible for his side to survive, as he continued: “We got ourselves in a great position to pull the miracle off when we got hit with the requirement to play four games in eight days. “Considering our opponents would not face that run-in we requested an extension from the league to make this fair for us but it was refused. “We put everything we had into the first one against St Ives and we should have won. “We learned Gosport played against Frome who fielded 10 men after a player walk-out due to funds, as they won 7-0. “We were terrific against Biggleswade to beat them on Tuesday and put us three points ahead, but the big ‘relegation decider’ was two days later on the Thursday. “Gosport looked sharper and the healthy investment from their chairman meant they were able to field a side that included three ex-Luton Town players. “Then at Frome, it wasn’t to be as we were told that the club raised £4k to pay unpaid players so they returned to full strength to play us. “We as a club have a lot more questions than answers about how the last week came to be and we have formally informed the league about our concerns. “For us and the players it’s time to reflect and plan and I wasted no time requesting clarification from the club on Sunday about plans and resource for the next season. “As yet with the reshuffle we don’t know what league we will be in.